February 2019: Tesla became the best-selling electric car brand in Germany with the Model 3 and Renault Zoe the top-selling electric car models. January and February 2019: Renault was the leading electric car brand in Germany at the start of 2019. BMW was the second best-selling electric car brand in Germany thus far in 2019. Tesla moved into third while Volkswagen slipped from first to fourth. Hyundai was the only other brand with more than a thousand electric cars sold in Germany thus far this year. In February 2019, new electric passenger vehicle registrations in Germany increased by 82.1% to 4,637 cars. Electric cars had a market share of 1.72% of the total German new car market of 268,867 passenger vehicles (PKW) in February 2019. During the first two months of 2019, electric cars took a 1.74% of the total German new car market with 9,285 electric passenger cars registered out of of a total 534,569 cars. As before, electric car sales in Germany were mostly determined by the availability of cars: while most manufacturers have long waiting lists, the sudden availability of the Tesla Model 3 gave a boost to registrations. Most electric models have long waiting periods with the three months required to buy for example a BMW i3 amongst the shortest in the industry. Waiting times for other cars are nearer to a year, which certainly put private buyers off. 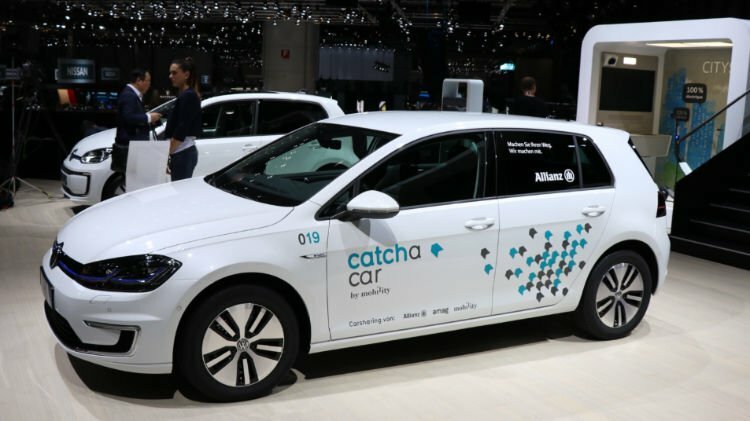 It should be noted that all figures in this article refer to passenger vehicles registered for use as electric cars for the first time on German roads – numbers thus include research and promotional vehicles and not only sales to final consumers. Electric cars in KBA statistics are for battery electric cars only and exclude plug-in hybrids or cars with range-extender engines. In February 2019, Tesla was the top-selling electric car brand in Germany for the first time with nearly a quarter of new electric passenger vehicle registrations. Tesla took the lead from Volkswagen that slipped to sixth with uncharacteristically low sales in February. In February 2019, Renault was again the second most-popular electric car brand in Germany followed by BMW, Hyundai and Smart. VW was sixth while Nissan and Kia swapped places. Audi slipped to ninth from sixth and Jaguar entered the top ten at the expense of Peugeot. Thus far in 2019, Renault and BMW were the best-selling electric car brands in Germany with sales fairly similar in both months. Tesla shot into third place with a very strong performance in February while Volkswagen slipped from the top to fourth. Hyundai sold more electric cars in Germany in February 2019 than in January but for Smart, Nissan, Kia and Audi sales were lower in February. In February 2019, the Tesla Model 3 became the top-selling electric car model in Germany and in Europe (where it outsold even the Meredes C Class, BMW 3 Series and Audi A4). The Renault Zoe slipped to second place in February 2019 followed by the BMW i3. The Renault Zoe and BMW i3 were the top-selling electric car models in Germany thus far this year. Both the Hyundai Kona and Nissan Leaf outsold the electric VW Golf in February 2019. The e-Golf was the third most-popular electric car in Germany thus far in 2019. Smart sales struggled against newer competition. Although Smart is due to go electric only in a few years time, questions of the survival of the brand that is still heavily subsidised by Daimler are apparently being raised in the boardroom. January’s star performer, the Audi e-Tron slipped from fourth to ninth in February. In February, the excitement certainly moved towards the Tesla Model 3.